Chris Roberts' ambitious upcoming space sim - what is Star Citizen (2014-2015, PC)? 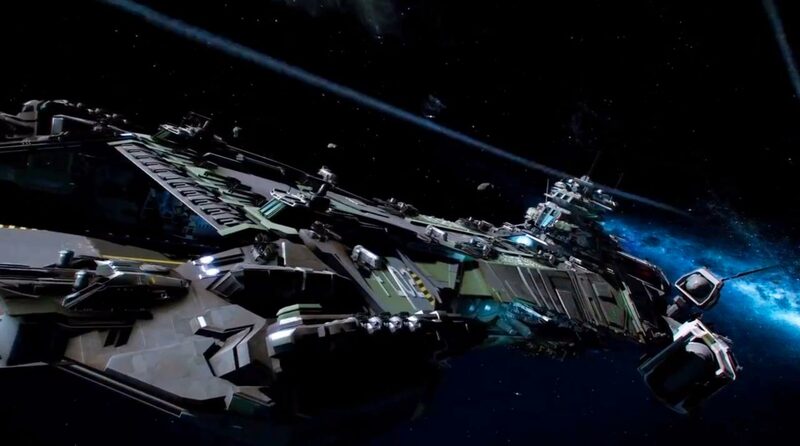 Chris Roberts' upcoming very ambitious space sim Star Citizen has made space sim fanatics drool impatiently after the project still in early stages of development. While David Braben's open sandbox style space sim "Elite" is doing pretty well in kickstarter, being very ambitious project on it's own right, Roberts throws in some heat promising to do much more things within the same game than Elite - and they've just crushed $5million barrier in crowdfunding donations (with kickstarter and RSI website donations combined). This will steal the crown from Project Eternity being highest crowdfunded game this far (although Project Eternity will still hold the crown on highest kickstarter.com funded game). Problems with Star Citizen may raise however, because the game promises to do and be such a vast amount of things at the same time, that quality might suffer while Elite might do the old-school Privateer-like free exploration better without trying to be something for everyone.. but lets not judge the game too early. On the paper Star Citizen sounds phenomenal space sim, perhaps most ambitious project yet in PC gaming space sim history..
Chris Roberts is video game designer, programmer, film director and producer. He has previously worked with company called Origin as a producer for space sim classics Wing Commander I, II, III, and IV as well as being involved with spin-off Wing Commander: Privateer with more open-ended game world rather than mission-by-mission campaigns. Other than that he was also heavily involved with another Privateer-like open-ended space sim "Freelancer" (2003). 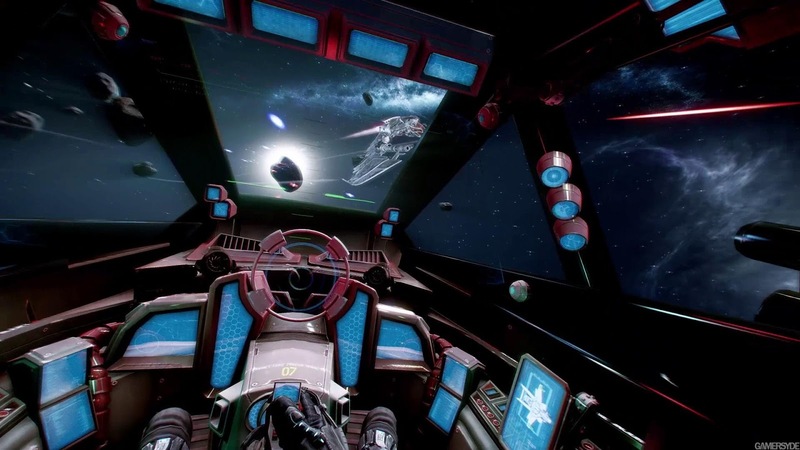 After this Roberts took a break of making games, but now he's back..
Star Citizen aims to be hybrid sort of a space sim for PC (exclusive) combining gameplay of Wing Commander mission-by-mission campaigns, and Elite/Privateer-like freedom with persistent space including numerous star systems to explore as you will. Star Citizen will feature whopping 70 star systems on lauch (increasing with later updates perhaps) matching Wing Commander: Privateer's equal amount. Not only that, but it attempts to create it as MMO-style multiplayer experience, but also to keep single-playing possible (through offline-campaigns). However emphasis is definitely on MMO side of things. While the game seems to focus bit more into massive multiplayer side of things and highest-end graphics possible, than it's competitor Elite - the two games share pretty much similar concept in terms of what you can do in the space. Both games offer similar jobs to play as smuggler, pirate, merchant, bounty-hunter, build wealth, and go where you want. It's the presentation of different things that divides the two games. Star Citizen's made for high-end PC's intending to crank out everything from modern computer's power - to take the graphics and whole immersion of space sims to next level. It's probably first indie-game aiming to create full "AAA"-game immersion (biggest budget games). The game will use CryEngine3 to ensure awesomely beautiful and detailed graphics not seen on current gen consoles, using about ten times more polygons per model than what the consoles now do -- perhaps even leaving next gen consoles slightly behind. 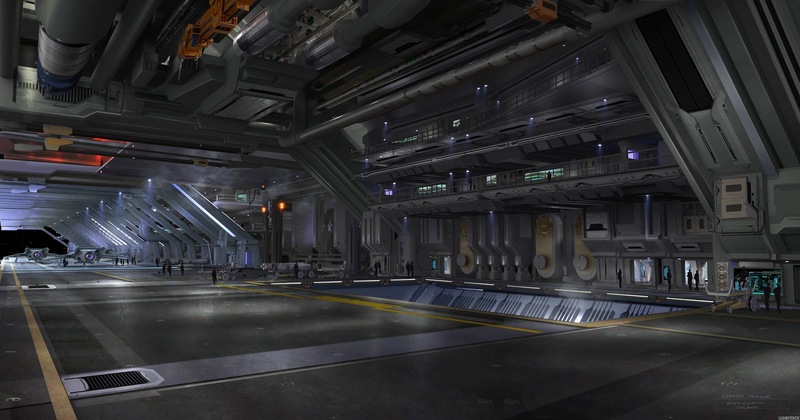 Not only the game tries to combine great missions with open-ended gameplay, but also to make the space look prettier than ever before (and at least this can be confirmed by viewing early pictures and videos of the game whereas combat sequences reminds grand battles of Freespace 2).
" -- One thing I don’t like about most MMO structures is the fragmentation of the player base between these “shards”. [...] In Star Citizen there is going to be one persistent universe server that everyone exists on. So you will never be separated from your friends, and if you want you’ll be able to join up and adventure together, you can." One of Roberts key elements in the game is to mix persistent space and free exploration with temporary "battle instances" created when two players face each other in their route. Multiplayer in Star Citizen is like "smart matchmaking system" that keeps track of players locations, and when they hit close enough each others for example flying on the route between planet A and planet B, the server will create a new instance where the two players can actually face each others and fight or do whatever game allows them to. When they are far away from each others, they're not actually fully simulated but rather tracked by location. In multiplayer mode there's also certain number of "slots" reserved for your friends to join in with you for a battle or protection. Roberts explains that if your friends are close enough, they can reserve a slot and warp in to join your events. However if they're further away warping most likely isn't possible. Server does keep track what players do in the Universe, and actions may affect to economy of the Universe which is fully simulated (on how detailed way is yet unclear). For example a player discovering a jump gate first may get it named after him. Star Citizen will aim to feature "micro updates" for the game content weekly, rather than big updates yearly or monthly. They may for example open up new star systems or add new ships. Keeping updates more frequently will keep the world more interesting and evolving. Doing missions in the Universe may earn your citizenship status, which provides different bonuses and benefits within the world. For example certain areas have more military force where they won't allow much pirates to hang around attacking traders. Earning citizenship status may ensure you to be higher priority for military to be protected against pirates attacks in such areas. However several further star-systems from known civilizations may be less protected and more hostile environments. Not every race in the space of Star Citizen are human -- but the races are to be revealed later on. 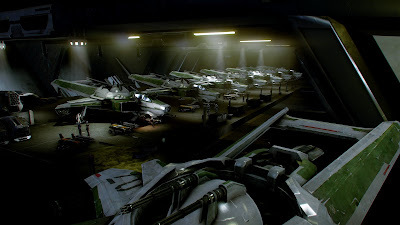 On the single-player of Star Citizen you could play campaigns for example take a seat in military career for "Squadron 42" and complete it's 50 missions for some reputation and rewards. You could do this alone, or join up with few friends if you wanted. You could afterwards return for example to your trader career and freely explore the space with almost no limits, hunting the glory and new planets to sell on. How free exactly the space exploration is though, is bit unclear to me at the moment. How much you can actually fly between points of interests, and how much of the "areas" are connected with "jump-gates" that warp you around? Flight model in the game is described as realistic yet fun to fly, with real physics working as they should in space. Every each of your ships thrusters are dynamically simulated and affect your ships movements. Ship customization will allow tactical elements depending of your style of play, is lighter more quick moving ship your thing, or do you rely on heavy shields and fire power? You can also distribute balance between power of your ships' shields and thrusters, by sacrificing one in cost of another real-time, to attempt tactical move in combat. Developers promise large selection of ships on and attachments with huge amount of detail, such as fully modeled 3D cockpits. Player will be able to buy from small scout-like ships to large freighters, of which an example is described as Star Wars freighter "Millenium Falcon". If you own a large freighter, you can have friends with smaller ships hang along you as your personal wing-men. All this information about Star Citizen and what it aims to be sounds hugely glamorous and insanely ambitious. One may wonder though can they implement both segments, campaigns & missions, and freely explorable working living and breathing space, without suffering in quality of the content as this will be a major task. If they have to cut off from either area, where will the emphasis lie between those two? Can ambitious game such as this succeed in it's all aspects with given budget (around $5mil + private investions)? The game is made with modding community in mind states Roberts, so modding will be made easy for fans to create their own mods which are possible to be ran on private servers. Multiplayer alpha build of some sort with limited gameplay could come out early as after 1 year of development, while persistent open world alpha/beta is set for 18 months after development, and full game around 2 years after development -- perhaps more (late 2014-2015). Read more from Star Citizen website.